This newly opened mountain retreat offers exquisite contemporary mountain decor, fine Colorado woodwork, and beautiful hardwood floors. 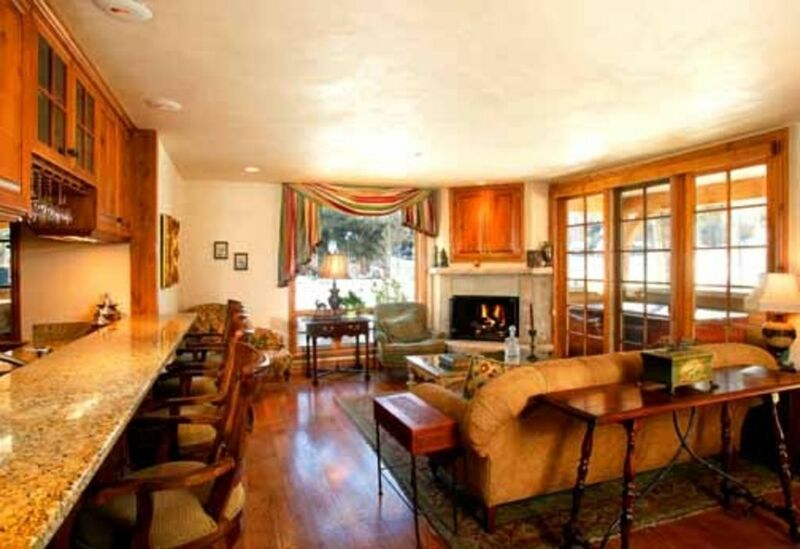 The Pines Lodge is situated in the heart of downtown Aspen. It is decorated with an elegant touch and top of the line furnishings throughout, including gas fireplace, granite counter tops, steam shower and wine cooler. Enjoy the easy access to town and glorious views of Aspen Mountain. Some might say this street level unit facing Ajax Mountain is the best there is. From the decor to the finish, it is truly Aspen chic. The Master Bedroom has a King Bed, LCD TV and private bath. The Second Bedroom has a Queen Bed, LCD TV and bathroom including a steam shower. There is also a pull out couch in the living room with a third bathroom including a beautiful marble shower. The galley styled kitchen has everything you would expect along with beautiful granite eating bar opening to the stylish living room containing another TV and fireplace. Lastly is a full size dining room with seating for 8. It's front deck containing a private hot tub and a gas BBQ. For the ski enthusiasts, we offer a ski storage room complete with boot and hand warmers. In the summer it becomes an excellent location to store bikes. Living room TV and TV in each of the two bedrooms. Private hot tub on front deck. Great little place, nice building, well equipped. Just wait until they bring Lift 1A down the hill, this will practically be slope-side. Condo is just a block off the downtown Aspen core so the street tends to be busy, but there are also multiple beautiful city parks in the immediate neighborhood. Walking distance to all town has to offer is great.